Want something different for your event? Adrian Solon is one of the most highly recommended Magicians of the Mind and psychic entertainers in the UK. He will perform astounding mind-reading miracles that your guests will never forget. He is so confident that you will book him that he will give you a free demonstration of his extraordinary skills! Secretly thought of names, numbers and mental images that he could not possibly know beforehand will be revealed to astonished spectators. He will make remarkably accurate predictions of the choices that people will make. Adrian Solon has performed in Las Vegas and Hollywood as well as throughout the UK. He is a member of the prestigious Psychic Entertainers Association, Equity, and the Newcastle Magic Circle. For corporate events, weddings, celebrations, stage shows and parties Adrian Solon will provide outstanding entertainment. Turn your special event into an unforgettable occasion! Mr Merlin is one of the most experienced & sought after professional children's entertainers & magicians in the North East, covering Newcastle Upon Tyne, Sunderland, Durham & Northumberland. He performs children's magic shows with live bunny, balloon modelling, mini disco & party games for birthday parties, Christenings, weddings & corporate events. He also provides close up magic for children & adults. Mr Merlin gained a reputation of being the magician to choose for kids magic shows with his unique style & sense of humour. He also performs magic shows in 10 different hospitals in the North East every month on children's wards on behalf of POD, a charitable organisation. South Shields Comedy Magician Kevin Robson. Kevin combines Classic and modern Magic with his own brand of comedy to give you some amazing Magic. Kevin performs Tommy Cooper’s famous glass/bottle, bottle glass trick Kevin’s also performs some magic of the mind with his Compulsion Trick that has been seen around Tyne and Wear. Amazing said an audience member at a recent magic show. You have to see it. Also meet bob o bear the world first mind reading teddy bear he will hypnotize you with his lovely cute face a star of Kevin’s magic shows. Special needs magic shows, retirement homes, Community Centres, Parties and more. All enquiries’ welcome but book early before your event to make sure of availability E-mail or Phone Monday to Friday . The full package for a kids party, not only does he supply a fun interactive magic show, but he also comes with disco, games, balloons, face paints, tattoos for a great two hour show! CRB checked and reg chaperones with Sunderland org, public liability ins. please note that I don't dress up any more! Don Moses is an hilarious stand up comedian and corporate magician based in Newcastle Upon Tyne and (parts of the year) in London. He travels throughout the UK and abroad performing at corporate events such as TV award ceremonies, convention dinners, staff reward days and company motivational days. Don's comedy and magic stage act is an excellent way for your guests to unwind and enjoy themselves. It is 5 star after dinner entertainment with lots of hilarious audience participation. Looking for a truly astonishing way to spice up your event? Then look no further! Charming and enchanting performer Danny Steal is here to add a little facade and mystique to all your functions whether they are corporate, formal or fun. This exciting illusionist is able to combine his excellent experience within the entertainments industry with his unique ability to play with audience perception. Performing nationally at private functions such as birthday parties, weddings and corporate events Danny has already built up an accomplished reputation. Providing an atmosphere unlike anything you have ever experienced before, this performance piece; which is fuelled by audience participation will leave your guests in excitable awe. This is both a fun and phenomenal way of keeping your guests directly involved with live entertainment. Robert Temple is a professional magician, mind reader, comedy hypnotist and corporate entertainer based in the UK but available to perform his amazing, unique performances around the world. Robert combines incredible magic, hilarious comedy and audience participation to create a memorable blend that will leave a lasting impression! Let us make your event truly unforgettable! Whether you are looking for entertainment for a birthday, engagement, wedding, ball or other private function, Robert Temple can provide a bespoke solution. Even if you are looking for something completely different for your next trade show, product launch, business conference or other corporate event, we have a performance lined up for you! From astonishing close-up magic, just inches from your face, to mind blowing mind reading and psychic entertainment. From hilarious stand-up comedy & magic, to fun-filled children's entertainment or even a comedy hypnosis show. But Robert's performances stretch far beyond the limits of pure entertainment and can actually help your business to succeed, increase leads and profitability with any one of a number of corporate packages. Your imagination is the key, and the only limit. We customise all presentations to suit our clients needs which means you can get the best package available to you, by going no further than Robert Temple Magic; The Power to Amaze. Don't forget to visit us at www.roberttemple.co.uk, join our free e-mailing list and order a free information pack to see just how we can help you and to take the first step to a brighter event. How are you going to decide which magician to book for your event…? Why would you book anybody else…? The very BEST in children’s entertainment. A beautifully combined magic & puppet show full of audience participation. The ‘Animupps Magic & Puppet show’, will make your child’s party a talking point for weeks to come. It’ll be the party they’ll all wish they had. It’s hosted by a dynamic, full time professional children’s entertainer with years of experience. In additional to being a magician, he’s a professional ventriloquist! This skill gives his children’s shows a truly unique dimension as the puppets he uses really come to life! Covering Newcastle Upon Tyne & the North East of England. Specifically Durham, Tyne & Wear, Northumberland, & Cleveland. Newcastle Magician of The Mind, Kennedy leaves guests astounded with the most unique comedy mind reading and psychological magic you've ever seen. Kennedy's performances in Newcastle and the surrounding area are much more than just a normal magician. He specialises in high impact after dinner speaking and corporate entertainment. Transform your event with a top class live act like Kennedy and your guests will leave boasting about it for years to come. Funny close up magician ideal for a bit of clean family entertainment. Flash has been performing around the north-east of England for 5 years and recently appeared on Simon Cowell's Britain's 'Got Talent'. Elliot performs classically styled magic in an off beat way. strange things have a habit of 'just happening' around him. matches visibly stretch between his fingers! chosen cards jump out of the pack high into the air! borrowed finger rings melt onto and back off a ribbon, in YOUR hands! all this and more. Treat your guests to miraculous magical occurrences, as the magic seems to happen on and around Elliot's person! She will add a touch of magic to your party or event! Annerley (Wizadora)attended a stage school from a small child and has performed in many stage productions in the North East, she then went on to TV acting where she has filmed dramas, short films and lots of commercials. Having two children of her own she is used to entertaining children. She thinks children's magic is fantastic as it gives the children confidence and feel good about themselves. Newcastle Magic Circle member Jonathan Pickard has performed across the length of the country, entertaining audiences from popstars to politicians with his unique brand of close up magic. Whether it be subtle sleight or stylised psychology, Jonathan leaves even the most astute participant in search of answers. Jack Strange is a table magic performer who will make your guests marvel at his close up magic. 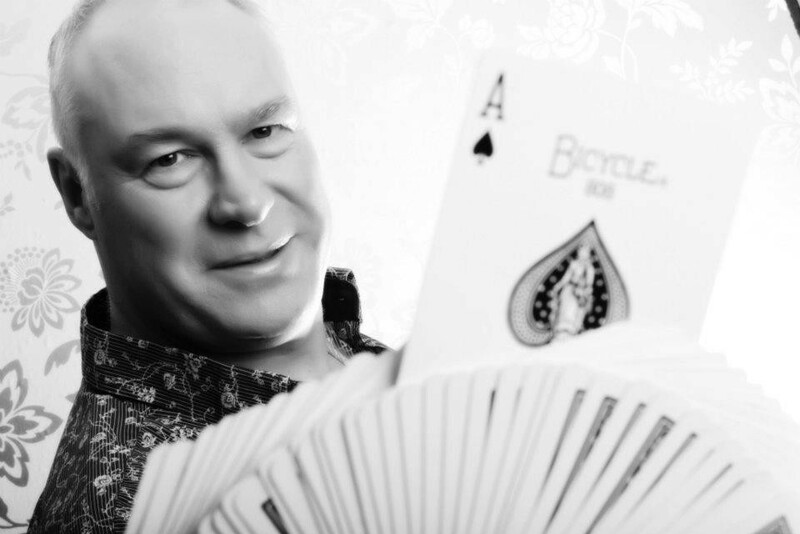 Based in Newcastle upon Tyne, I have bewildered guests all over the North East with my own brand of sleight of hand magic that will leave your guests talking about your event for years to come.